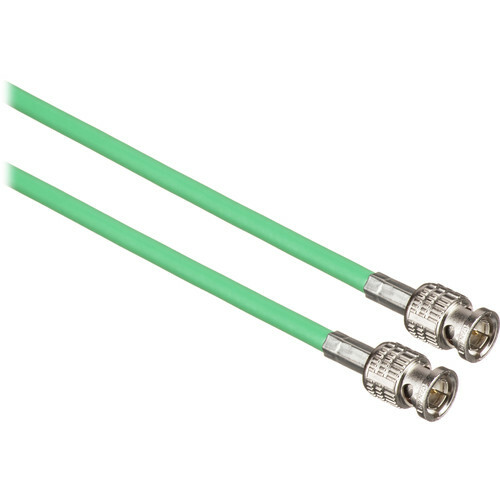 The Canare 125 ft HD-SDI Video Coaxial Cable - BNC to BNC Connectors (Green) is a precision serial digital video coaxial cable that offers throughput for HD-SDI video signals for professional broadcast applications. Thanks to dual copper braids that impart high flexibility and foam PE dielectric insulation, this RG6 coaxial cable can be bent around tight corners or run through tight spaces, while still providing a high-quality, low-loss transfer. Box Dimensions (LxWxH) 9.9 x 9.6 x 1.8"
125 ft HD-SDI Video Coaxial Cable (Green) is rated 5.0 out of 5 by 3. Rated 5 out of 5 by Robert from Well built cable! Used the HD-SDI cable for connecting our new Sony EVI-H100S PTZ cameras. Cable pulled great through conduit, just make sure you protect the BNC connectors while pulling. Rated 5 out of 5 by Mark from Best Cable Canare is known for good quality cables, and this did not disappoint.